Everybody loves The World's Best Breakfast at the Swiss Farm Inn - and it is included with every overnight stay! If you have a special request just ask! *Dinner is served most Friday, Saturday and Holiday during the winter season for $20.00 pp, and available by request at other times. Check the Blackboard for Amazing Specials Everyday! You tell us how to cook them and we are going to add in some homefries, toast, bacon, muffin, coffee, and juice. Three eggs sfilled with onion, pepper, mushroom, broccoli, sausage, bacon, ham, potato & American cheese. All with toast, homefries, bacon, muffin, coffee, and juice. Kinda like a Western but it’s a Whalen. Three eggs filled with onion, pepper, country ham & American cheese with homefries, bacon, muffin, coffee, and juice. You probably could figure this one out on your own. Onion, pepper, broccoli, mushroom, hot peppers, and Vermont cheddar with toast, homefries, bacon, muffin, coffee, and juice. Bulkie roll fresh from the griddle topped with 2 eggs any style, bacon, and cheese. With homefries, bacon, muffin, coffee, juice. It’s a 3 egg omelet filled with broccoli, onions, Vermont cheddar & yum. With homefries, bacon, muffin, coffee, juice. It’s kind of like scrambled eggs gone wild. Three scrambled eggs filled with onion, pepper, mushroom, sausage, & Cheddar with homefries, bacon, muffin, coffee, juice. All pancake breakfasts include: homefries, bacon, muffin, coffee, juice. A warm honey wheat wrap filled with 3 fluffy scrambled eggs, onion, pepper, hot pepper rings, VT cheddar and medium salsa. With homefries, bacon, muffin, coffee, juice. 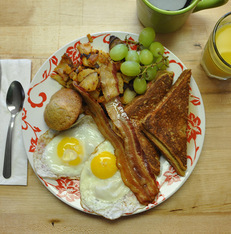 Homemade hash hot off the griddle topped with two eggs any style, toast and homefries, bacon, muffin, coffee, juice. Bowl of Oatmeal, with raisins & side of brown sugar. Anything above half size and half price. Includes milk and juice. Roger’s Advice has not gotten better with age, but it is still FREE for the taking! All prices are plus 9% Vermont state sales tax. Eating raw or under cooked foods may be harmful to your health. "It feels like home but with better food." "Your kindness and hospitality made our stay warm and cozy. We will never forget the awesome meals!"